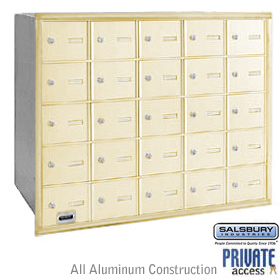 Made entirely of aluminum, 4300 series mail package drops feature both a front and rear access locking door. Mail is deposited through a non-locking access panel on the front. Mail package drops are approved for U.S.P.S. curbside mail delivery. Master postal lock not required.